"Humans are no longer at the top of the food chain." A new US trailer has arrived online for the Japanese live-action adaptation of the manga series Tokyo Ghoul, which already opened in theaters in Japan back in July. The story is about a Tokyo college student who is attacked by a ghoul, a superpowered human who feeds on human flesh. He then discovers there's an entire race of ghouls and becomes a fugitive on the run, the "one and only existence who knows the two worlds." Starring Yû Aoi, Masataka Kubota, Shun'ya Shiraishi, Nozomi Sasaki, Fumika Shimizu, Yô Ôizumi, and others. One of the quotes in this trailer claims the film is the "best live-action anime adaptation to date." Not sure if that's true but it's worth a look. Human and ghoul. The one and only existence who knows the two worlds. 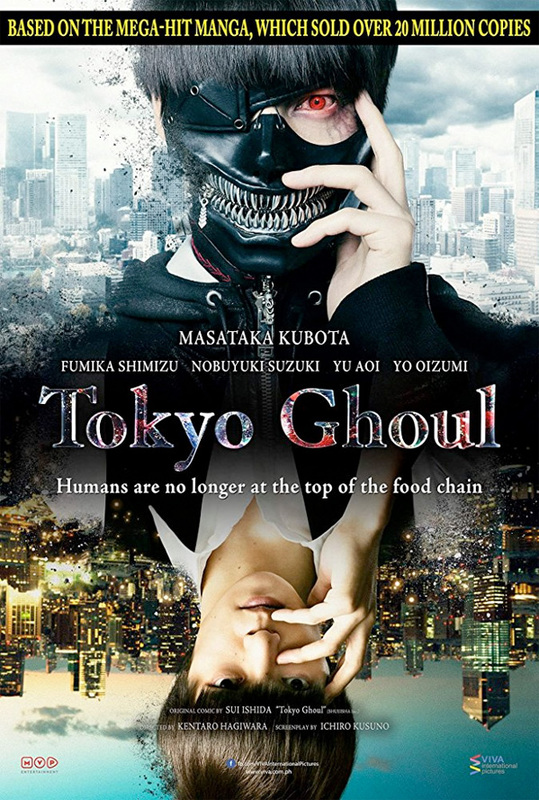 A Tokyo college student is attacked by a ghoul, a superpowered human who feeds on human flesh. He survives, but has become part ghoul and becomes a fugitive on the run. Tokyo Ghoul is directed by up-and-coming Japanese filmmaker Kentarô Hagiwara, of the film Anniversary previously and a number of shorts. The film is adapted directly from Sui Ishida's "mega-hit manga" of the same name, first published in 2011. This already opened in Japan back in July, and also played at the Fantasia Film Festival and Anime Expo earlier this summer. Tokyo Ghoul will arrive in select US theaters starting October for one week. Who's interested in seeing this?